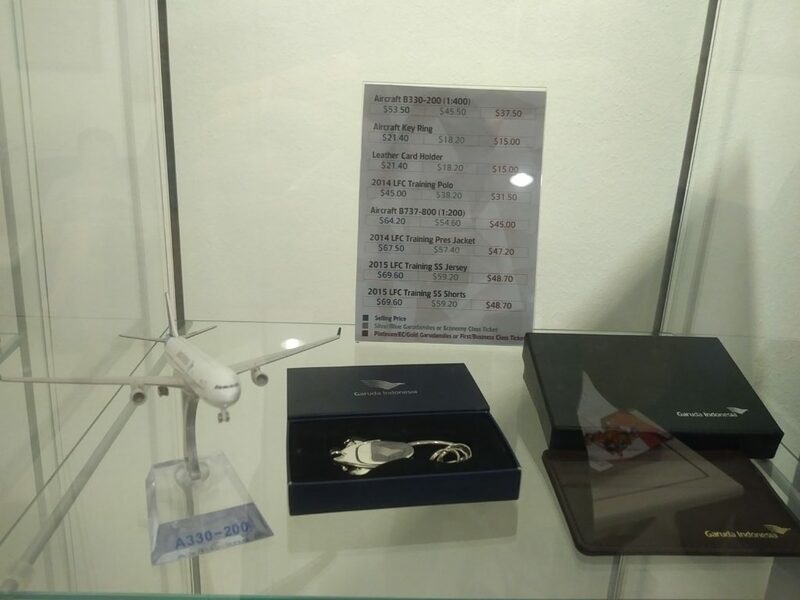 Years from now, when we look back at Garuda’s 90% off award tickets promo, we’ll still be arguing about just what it was that Garuda wanted to achieve with this. The most convincing theory I can conjure is that Garuda management intended from the start that this would be a publicity stunt. 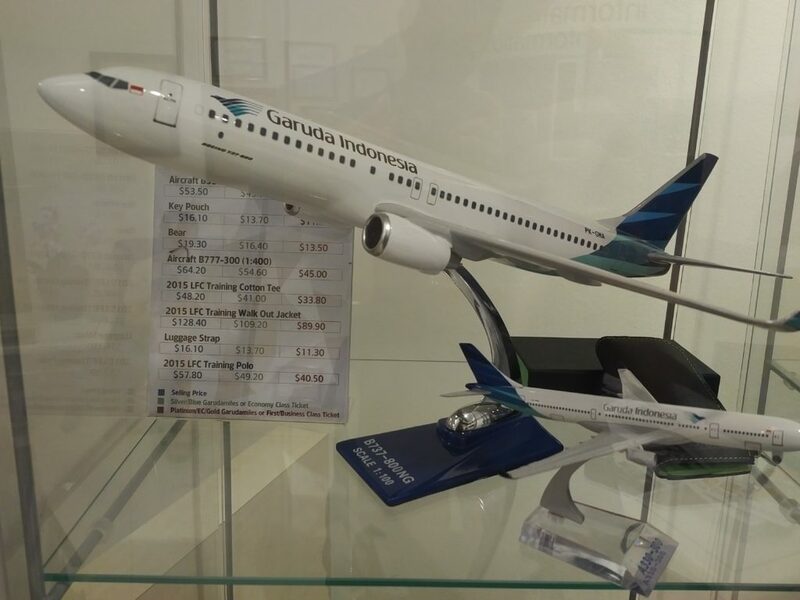 Garuda’s got great new First and Business Class products, but you’d be hard pressed to find any trip reports about them online (especially First Class, but here’s one!). Who are the people most likely to write trip reports? People like me. Who is the most likely to jump through all sorts of hoops to get fire sale award prices? Ditto. 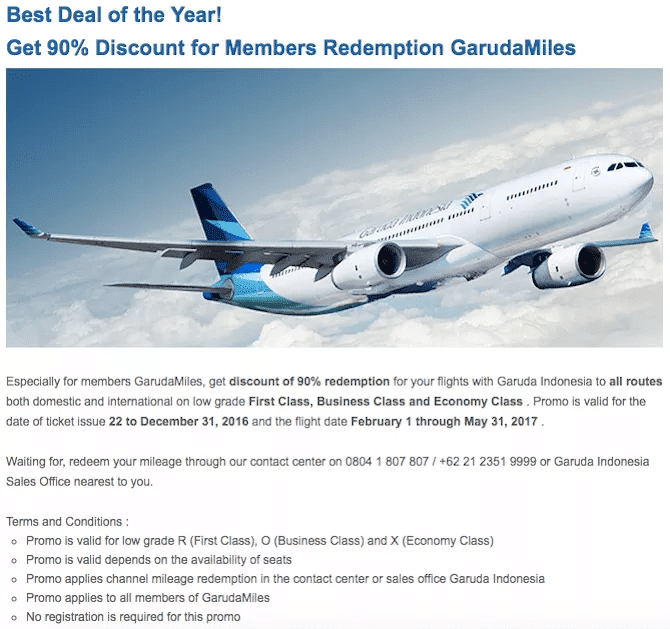 So by launching a limited time, too-good-to-be-true promotion, Garuda found a way of converting saver award seats (which would otherwise have flown out empty) into one heck of an interweb buzz. Overnight they got tons of coverage on sites like Flyertalk and Boarding Area, and it’s safe to say a lot of people who didn’t know about Garuda Indonesia before are now talking about it. 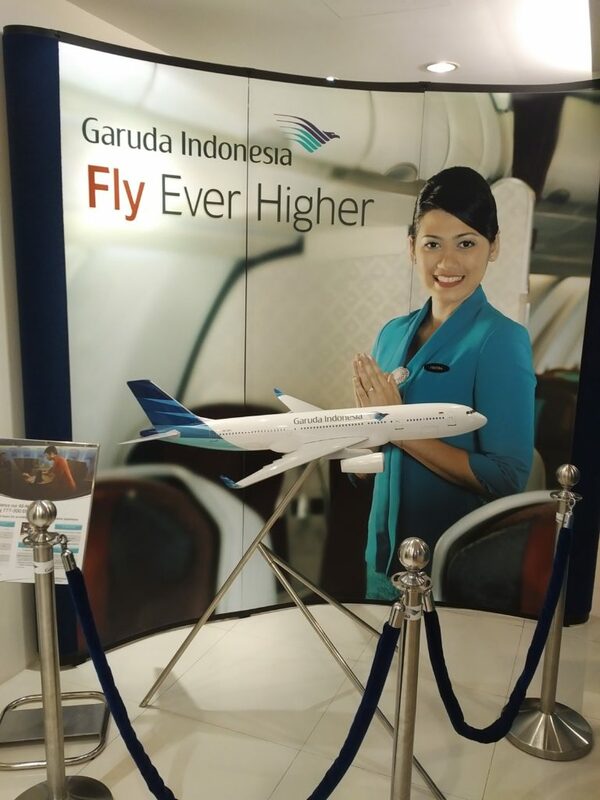 People will fly on their premium cabin products and write trip reports with photos, and before long these will propagate themselves throughout the web, boosting the awareness and image of Garuda. 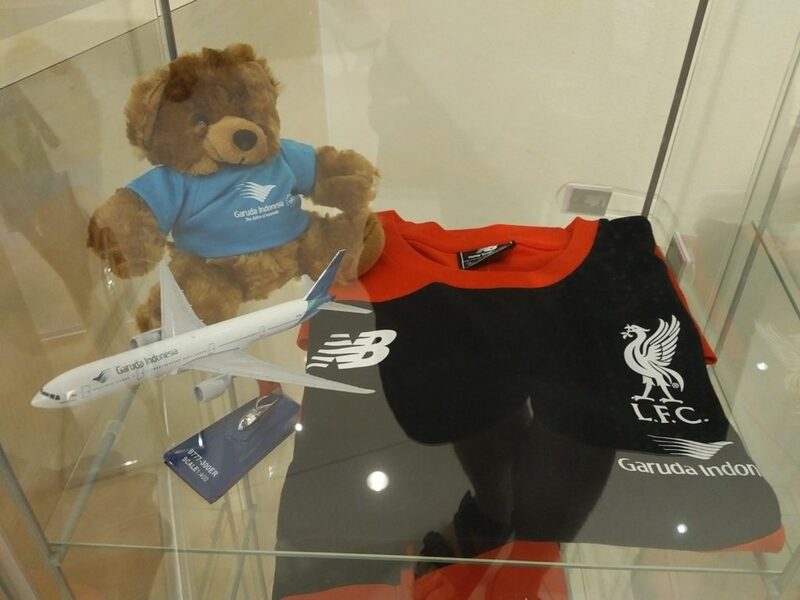 There are of course many other theories out there- some speculate that it was an ill thought through promotion that got out of hand, others that Garuda wanted to make a bit more money from Citibank and needed to encourage mileage transfers. The promotion ended up being pulled early, which led others to speculate that Garuda intended to do this all along- get people to transfer their Citibank points over so Gaurda would earn some revenue, then pull the promotion before the transfer went through. In the end Garuda promised to honor all award tickets issued before they pulled the promo, which put to bed some of those theories. But object lesson here- nothing is confirmed until your ticket is issued. Whatever you believe, I think we can all agree that it was an amazing promotion and we are unlikely to see anything like it for a long, long time. Which brings me to my experience of trying to get onboard with this promotion. Someone on the comments in the original Garuda post said something to the tune of “I’m not sure anyone with a full time job could have jumped through the various hoops.” And he’s definitely right. Because over the past few days I’ve spent easily 3+ hours on the phone with various people from Citibank and Garuda trying to get my transferred points to post, having to explain the same story again and again. This is in addition to the time I spent researching different routes and physically going down to the ticketing office to get the ticket issued (fortunately I’m on leave this week). But it’s finally done, and I now hold a confirmed reservation in Garuda J from Bali to Narita. It’s not the F award I was so coveting, but hey, win some, lose some. And 12,600 miles + S$162 for a return business class ticket is not to be sniffed at. The day the promotion was announced I jumped on the phone with Garuda. After a 40 minute session of pricing out different routes and cabins, I finally concluded that an F award wasn’t realistic (only AMS and LHR are serviced with F, and only midweek departures were available, and I couldn’t justify paying the surcharges for what would have to be a very short trip). So I settled for a J award. I transferred my Citibank Thank You points to Garuda on 23rd December. The T&C say that points transfers can take up to 14 days, but they just say that to cover themselves. In reality transfers mostly go through in 2-3 business days. On Monday 26th December I was already seeing people posting about successful points transfers. Still my account had nothing. 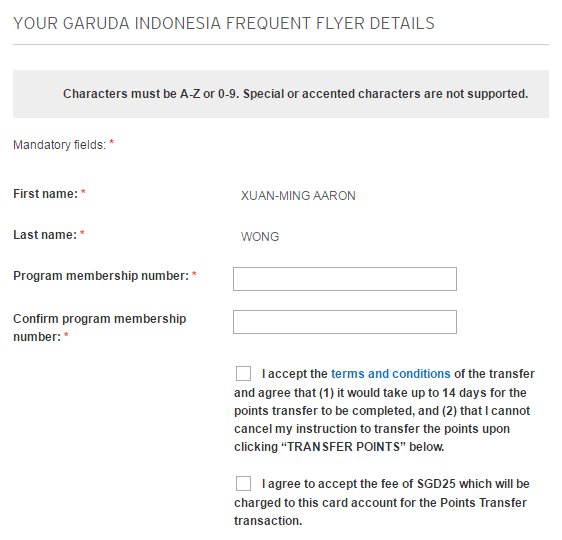 That’s when a sinking feeling started forming in my stomach as I realised it could be because my Citibank name had a hyphen in my pinyin name, but my Garuda account did not (because their system doesn’t support it). Why oh why did my parents want me to be unique, I thought to myself as I picked up the phone to start the first of many calls to Citibank and Garuda. Citibank told me they didn’t do any sort of verification on their side, and it was all up to Garuda to accept or reject the transfer. Gaurda told me they couldn’t see any transfer yet but they’d monitor it. On the 27th, still no points. 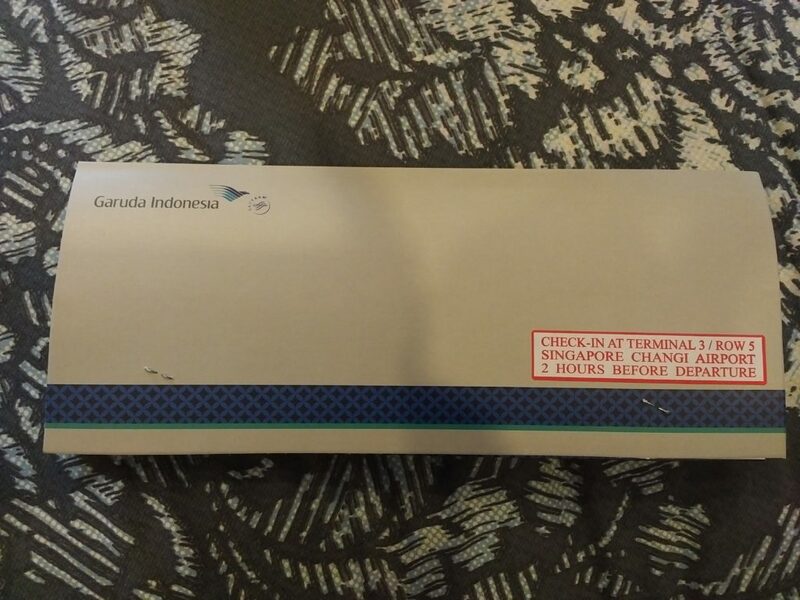 I called Garuda again, explained the issue with the name, and was told that I’d need to check with Citibank to see if they could change the name on their side. Citibank told me I’d need to check with Garuda. On the 28th, the points were nowhere to be seen. I called Garuda and this time was asked to call their Jakarta office for “escalation”. Garuda customer service opened a file for me and asked me to send an email with all the details. I sent it in. On the 29th, I got a call from Gaurda saying they had no evidence of Citibank ever making a transfer. 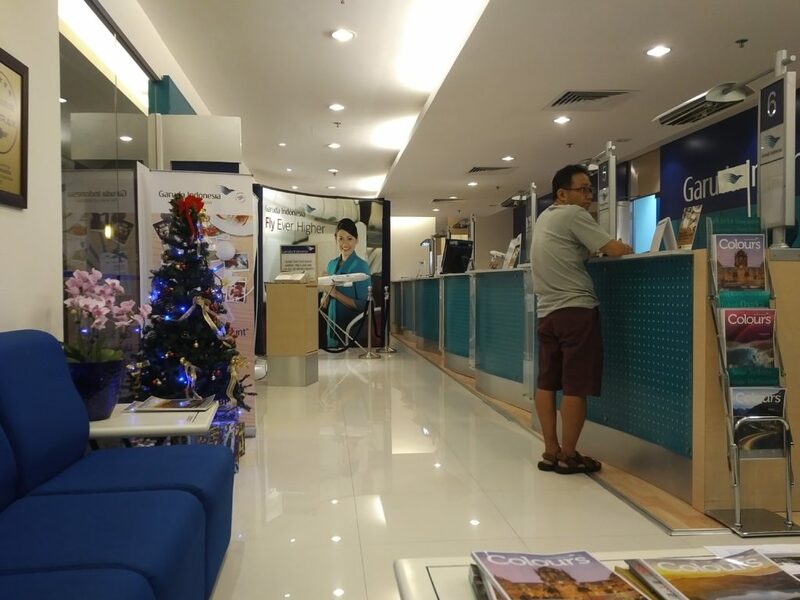 I called Citibank, conferenced Garuda in and got them to talk to each other. They told me I’d get an update later that day. 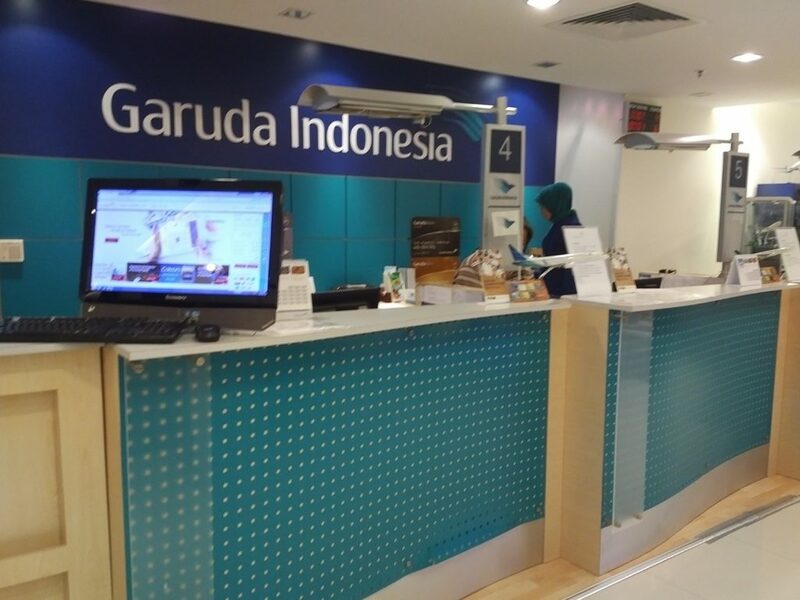 Later that day I received an update from Citibank saying that Gaurda miles would post more slowly if the Garuda account was “new” versus if it was one with prior activity. I have no idea why this might be the case but anecdotally I had heard a few people on FT talking about that. They said they’d chase it up. Finally, I awoke on a blissful Friday morning and saw that the points were in. Never before have I been so happy to see 13,000 miles in my account. A big shout out to Natalie from Citibank for being so persistent with the follow up. And so it was time to journey down to Middle Earth. 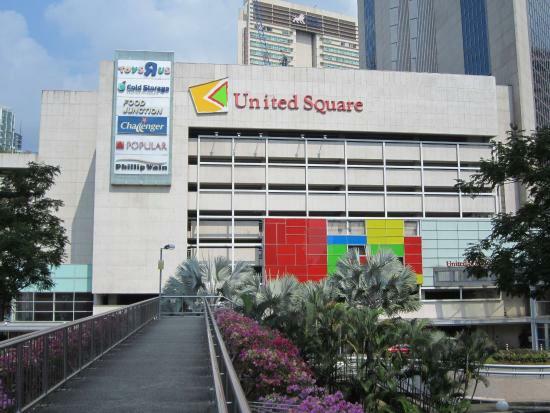 Garuda’s offices are on the 12th floor of United Square in Thomson. Because it’s the last working day of the year, they were on a half day and I had to get there before 1pm to close it out. The place was deserted when I got in at around 1130 am, with only a handful of customers who clearly weren’t redeeming award tickets. I had this strange idea in my head that the whole Garuda office would be full of fellow travel hackers and we could make this our own little meetup. And some other Garuda tchotchkes. 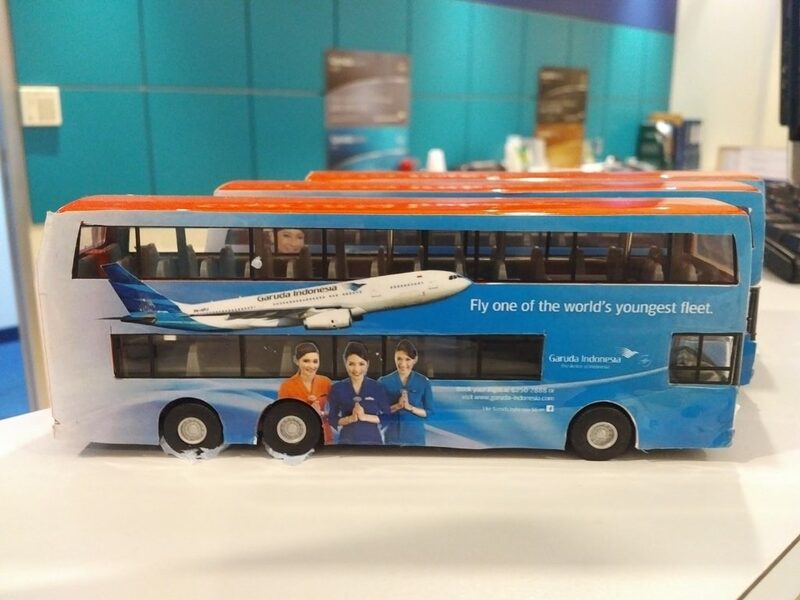 Incredible how Garuda went from deathtrap to world’s youngest fleet in the space of half a decade. I’m sure there’s going to be a HBS case on this before long. 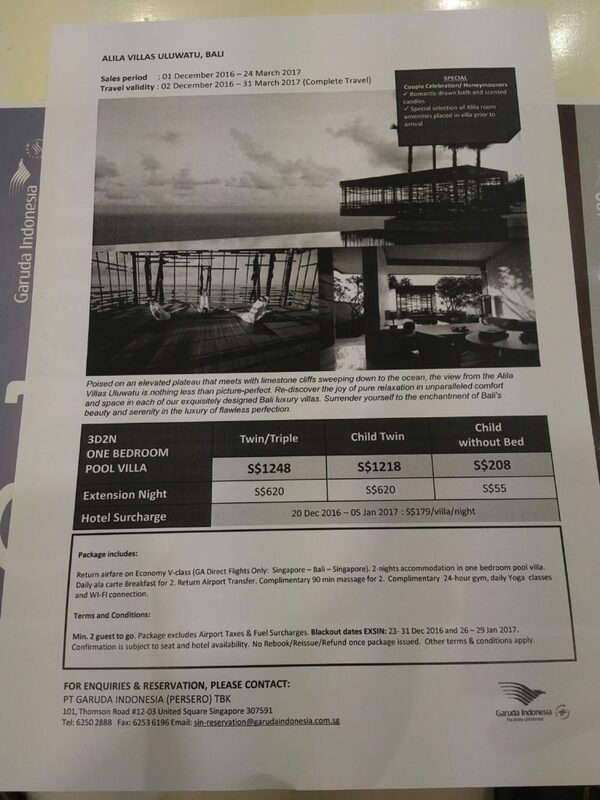 They were also advertising Garuda vacation packages to Bali. They have very naughtily excluded airline surcharges from their price quote (which isn’t allowed, as per SG laws) but I’ll let it slide. It was a slow business day, as evidenced from my queue number. 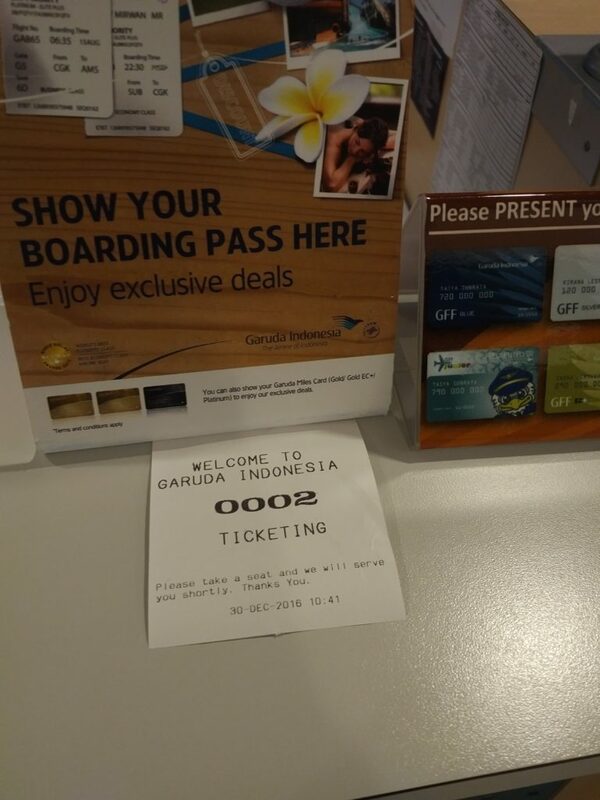 And finally it was my turn, and 15 minutes later I had my Garuda ticket in my hand. I read reports that you needed to have your physical membership card, but I wasn’t even asked to show my digital one. I received an email confirmation while I was still at the office that my ticket was now issued. So I’m going to be reviewing Garuda’s J product over the May Day long weekend. I will need to position myself to Bali to catch the flight, and very honestly if I weren’t in the hobby of writing reviews of different airline products I might not have gone through all that trouble. The positioning ticket + taxes on the award is costing me $360 out of pocket, and that’s not taking into account my hotel in Tokyo. But as Jeriel reminds me, I should be taking advantage of my flexibility to travel on short notice. He was having as much of a milegasm as I was about this promotion and would have very much liked to up and go to Amsterdam, but with a wife and kid in tow the equation becomes much more difficult. 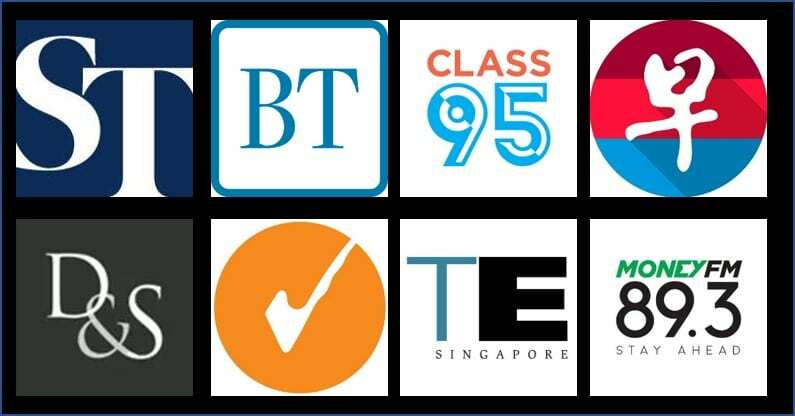 Today is the last day for ticketing those amazing 90% off tickets. To everyone who got one, congrats! I’ll expect those of you travelling in F to be churning out trip reports. To those who missed out, take heart. Deals come and go all the time. Such is the nature of the hobby we do. I personally can’t wait to see what sort of deals 2017 has in store! thats a powerful move – conferencing in citi with garuda. congrats! Haha my receipt number was 005 at 2pm (they close at 3pm today) – so yep, definitely not the swamp of travellers waiting to ticket their award flights that I was expecting. What an award promotion to round of 2016 – happy new year to everyone, and here’s hoping 2017 brings about more chances! hahah they told me 1pm. i’m glad you got yours! i wanted to make some small talk with the customer service reps about how many people were redeeming these tickets, but they weren’t in the small talk mood. Perhaps they were more relaxed come closing time, because they were quite chatty when I went. They were sharing how people from all over the world were calling the SIN office to block seats and either using creative ways to get friens to help issue their tickets, or altogether unable to ticket before the deadline. Reckon there’d be quite a lot of awards holds that will be going unused. Our friends in the US may be complaining, but I’m definitely glad that this was one of the few promotions that us in SEA can take advantage of. ah yes, seeing the dot matrix printer took me right back. Right down to the tearing off of the perforated section. hahahha don’t you get paid to do a job? Managed to get F class from SIN to AMS and F class from LHR to CGK. Looking forward to the trip! Check out more details on our redemption. Congrats, and looking forward to reading about your experiences! Previous Entry How does a 20th century airline seat hold up today?